I’m sticking with my mantra about Kia – they are definitely running with the “big dogs” of the car industry. While in California (enjoying the sunshine and warm weather while the rest of the U.S. endured winter), I spoiled myself with long drives and road trips in the new 2016 Kia Sorento. This SUV is impressive, classy, comfortable, roomy, stylish and fun. Most notably, however, is the fact that it appeals to a wide range of people from different walks of life. While testing driving the car, I couldn’t help but ask family and friends for their opinions. The results? The Sorento nearly converted a Porsche lover. Sky for days: Kia hit the mark (again) with a panoramic sunroof that reaches all the way back to the rear passenger seats. Each time I opened it with new passengers, their responses were along the lines of, “Oh wow!” and “This is beautiful.” Each time it happened I felt proud, as if I designed the car myself. A sunroof is especially important for Californians, many of whom love the state’s endless blue skies, warm sunshine and cool breezes. Another great aspect about having a panoramic sunroof in an SUV is that it makes the car feel a bit like a family-sized convertible. Passenger Perks: Many SUVs have the tendency to sell drivers on the space, but often steer clear of the comfort factor. The 2016 Kia Sorento can seat six passengers comfortably. Not only does the front passenger get to enjoy all the same luxuries as the driver, but also the back seat passengers can recline, charge their devices, enjoy a decent amount of leg room, and set their own climate temperature. I managed to fit at least four adults in the back without complaints. In fact, someone nestled into the third row seats and fell asleep immediately on one of my Sorento road trips. Stress Free Driving: One thing I don’t like about many modern vehicles is that the navigation doesn’t allow you to change the destination while the car is in motion. I know this is for safety reasons but it can be frustrating, especially if your co-pilot is the one trying to use the system. Using the navigation in the Sorento was great not only because I was able to make changes while in motion, but also because the navi was accurate and swift with recalculations when I drove a little off the beaten path. The system was also great for finding nearby POIs (points of interest) and alerting me about being low on gas and then searching for nearby fill-up stations. Another perk of the navigation is the turn-by-turn display on the dashboard. This feature was really helpful for keeping my eyes on the road and keeping me on track to my destination. Besides the navigation, the Sorento also offers safety features like lane departure and blind spot notification, along with proximity alerts. 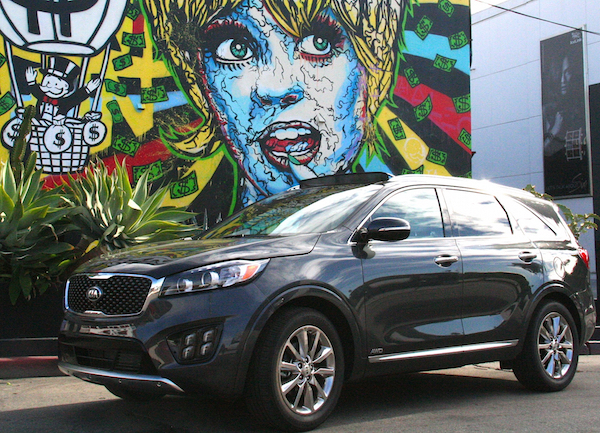 Keeping it flush: The 2016 Kia Sorento, with all of its space and curb appeal starts at about $25.5K. Not bad! Great for saving you some extra cash. 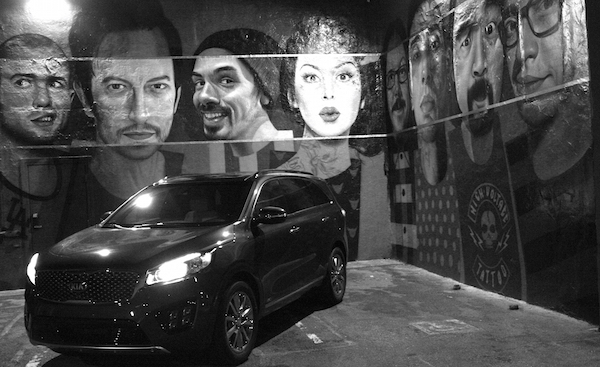 While I greatly enjoyed the Sorento, it did have two disappointments. If the SUV is full of passengers, the Sorento only has enough storage space for two small, carry-on luggage bags. This was a discouraging factor, particularly for the moms and traveling families that checked out the car. On one of my many road trips, the car was pretty packed with people, but there was hardly any space for luggage. If you have a big family, you might need to add a rooftop storage container. Also, I noticed the car doesn’t have a lot of oomph— it lacked power. After doing a little research, I discovered my test drive model was a four-cylinder. Although the Sorento isn’t a huge car, I’d recommend one of the larger engine sizes like the Limited V6. Other than that, the Kia Sorento is great. Both men and women enjoyed the ride, the look and the space. Go ahead Kia, with ya bad self!